OK, I'll bite: what is DOM? I can't see anything in the picture, but these old eyes aren't as good as they used to be. Darned Old Mule? Drop of Moisture? Dead on Maturity? Scroll on down this thread for Randell's visit to the DOM rock and then watch the movie Fandango. Feb '09 visit to DOM rock. hey. it is scary as hell getting out on that rock. Yeah, I climbed gingerly up on it. Couldn't bring myself to run up it like Kevin Costner. Now that's the money shot. Ever since I saw the movie I always wanted to see the view from that rock. I agree you have to be a bit wild and crazy to climb up that rock in full stride and with cowboy boots. Here's the clip from the movie - 1:24 is the spot. It's in Spanish...the first one I could find. This post just came in handy, as my brother just called from Study Butte, asking me how to get out to the Dom Rock. Thanks Jeff for posting those coordinates. I originally just told him, pull off at the big hill and walk towards the river on the east side of the big hill peak. He'll find the GPS coordinated much easier! A few weekends ago.. The original DOM rock and the movie rock.. I couldn't believe how easy it was to find this place. In the movie they make it look like you have to hike through the desert to get there but it's really just a stone's throw from the road. 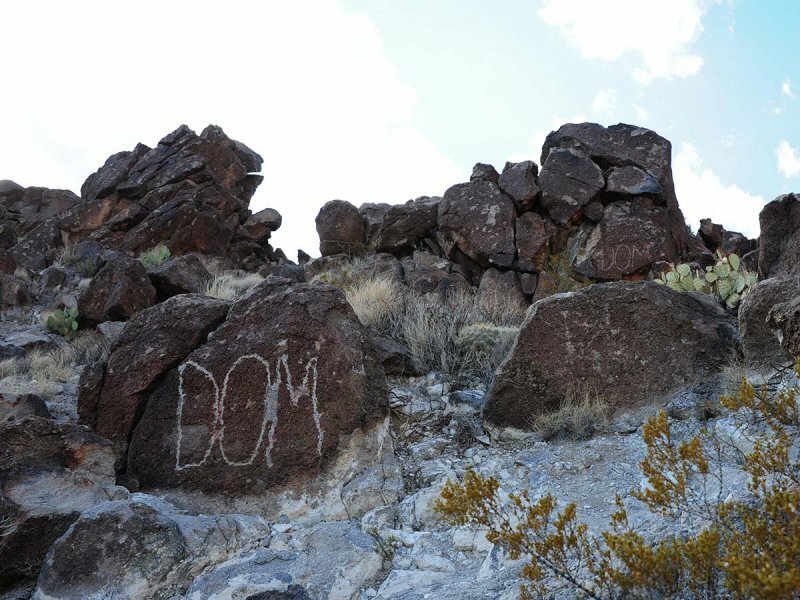 Finding DOM was the highlight of our trip to West Texas. Standing where Costner stood, admiring the view, enjoying champagne (we didn't buy Dom, but we did get some good stuff). Also, someone left there Dom cap under the rock which we thought was cool. We left our cap as well. Yeah, one trip out there several years ago, early 90ish, we were gonna go out there and recreate it, Dom and all. We were pumped. Stopped by the liquor store on the way out of town. Ah, we knew it was expensive, but hell, a bottle of Korbel was about 8 bucks, so we "upped" our budget to 50. We were gonna live large. Disappointment would be an understatement.